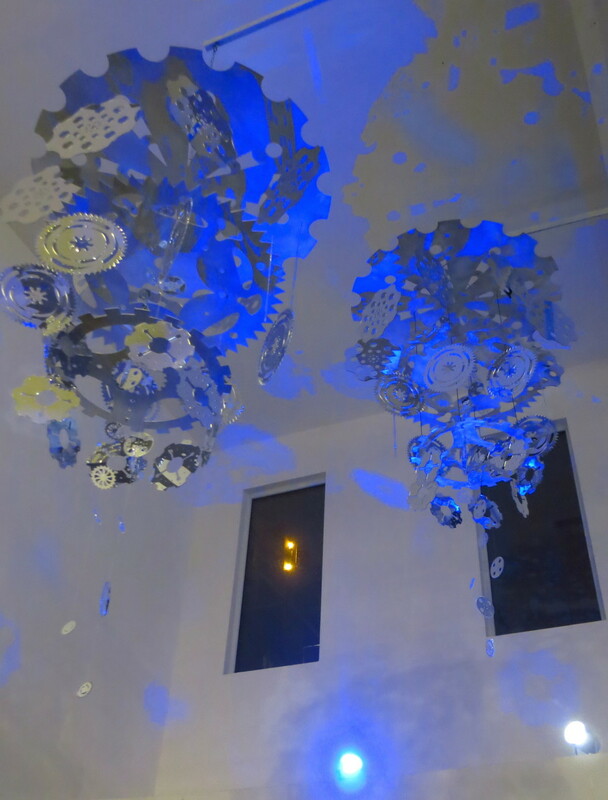 2015 - wall sculptures shown at Scope Art Fair, Miami, Reflections solo show in LIC , NY, Art Southampton art fair. Selected works now part of private collections in NYC and Washington DC. Some works are still available. 2015- Private Commission 2015. Five 7.5' tall x 3.5' wide Laser-cut steel panels were created to encircle a formal entertaining garden in Calistoga CA. 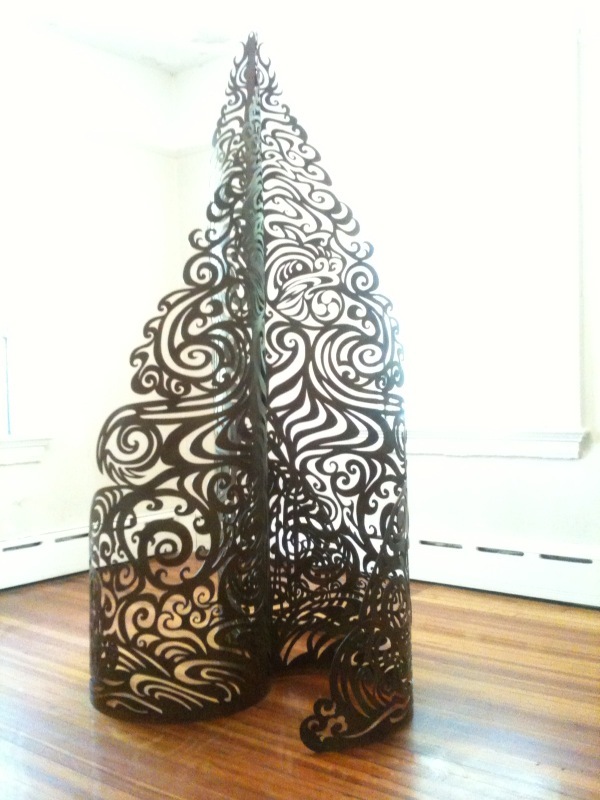 2011 - A personal project of a laser-cut steel sculpture meant to honor water of the pacific rim cultures affected by the 2011 earthquake and tsunami. Featured at the Art Southampton Art Fair, NY, New York Maker Faire 2012, the Sculptors Guild Governors Island show, The Fountain Art Fair NYC, 3rd Ward Art Collective NYC. Now part of a private collection in Miami. 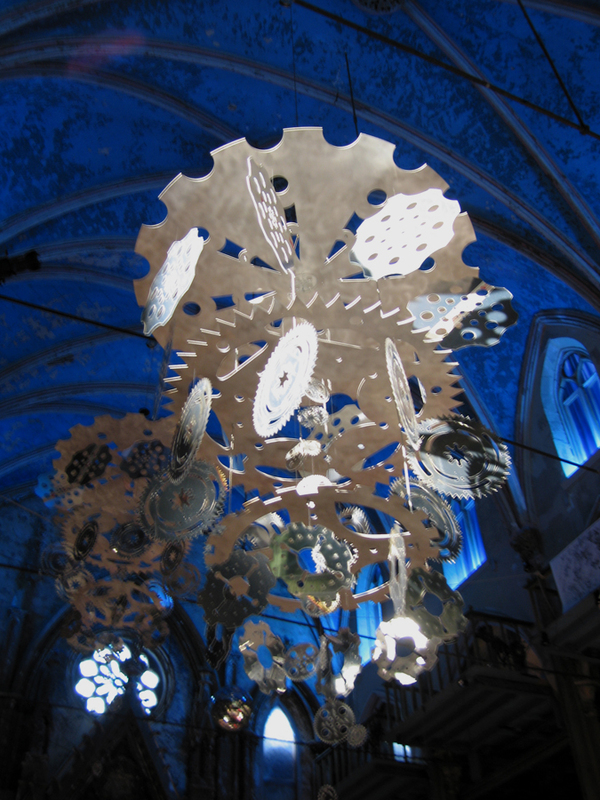 2010 - A commissioned work for a concert at the Angel Orensanz Center for the Arts NYC, consisting of 6 aerial sculptures that represent clock gears released from linear timekeeping. Made of mirror and aluminum, stainless steel aircraft cable and monofilament. For sale individually, or for rent for special events. Sculpture Now 2016 exhibition at The Mount, Edith Whartons Estate in the Berkshires, MA. This expansive group show was exhibited June-October 2016. 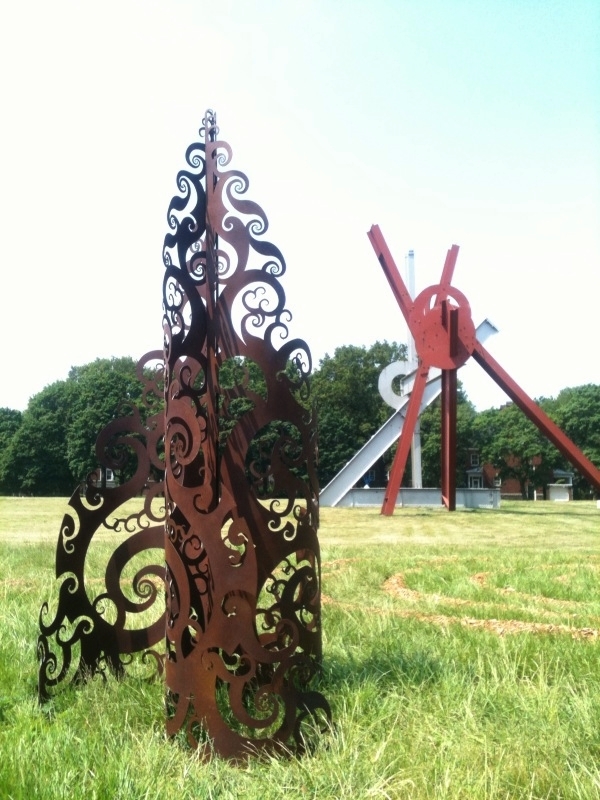 The sculpture is made of laser cut steel and stainless steel. 8' h x 3' w x3' d. For sale through the Sculpture Now exhibition. Mars Transmitter, beta - A conceptual, futuristic steel totem pole containing a sphere filled with our transmittable human consciousness, and intended as a beacon of human identity on Mars. Mars Transmitter, beta is inspired by lofty goals to colonize Mars and expand human consciousness beyond planet Earth. The transmitter has been built into a steel column that strives to modernize the the physical expression of the Totem Pole used by Native Peoples to connote their local tribal identity. Mars Transmitter hopes to be a catalyst of personal human insight: what ideas represent our human identity? Can our species’ consciousness be transmitted? And, if so, what human thoughts and ideas are worthy of sharing beyond Earth? 2015- These images are of a sculptural work in progress, created as a dynamic wedding gift. The light sculpture was put in a plain wood box. The box was written on by the guests at the wedding, and the bride and groom then set the box on top of a bonfire in order to "open" the gift. What resulted was one of the riskiest and most unique heat-applied patina's I've ever made. soon to be a freestanding light sculpture on a steel base, for their new home in NY. 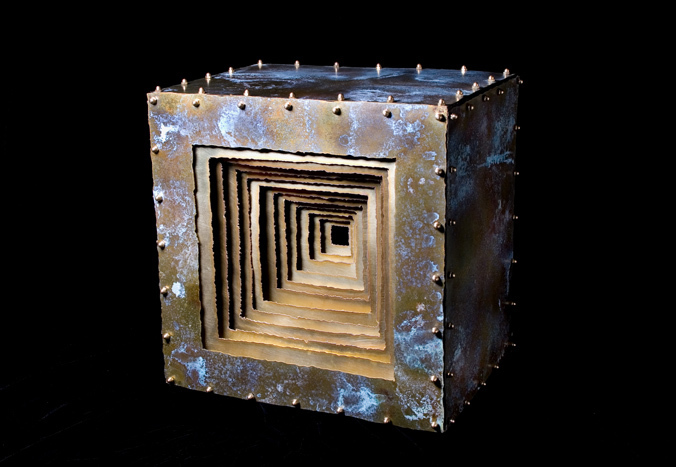 2011 - a wall hanging sculpture inspired by the deconstructed NYC water tower from which the redwood material originated. 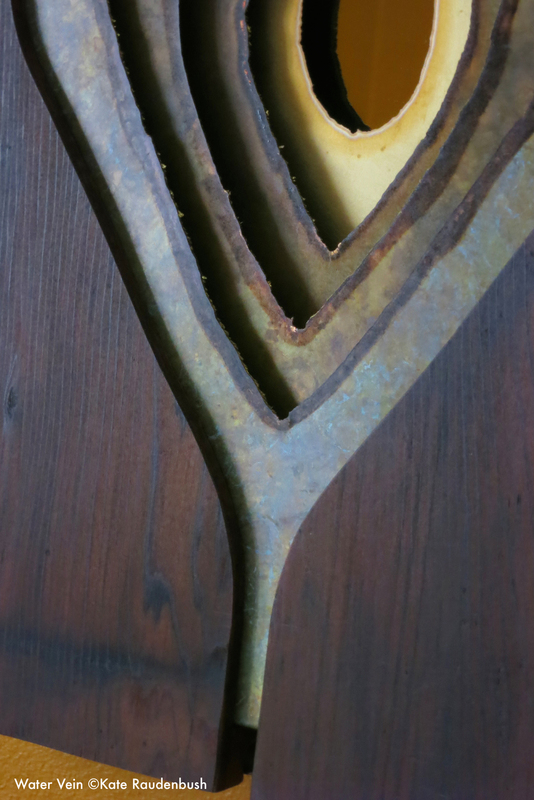 Inside are torch cut patinated layers of brass flowing top to bottom through the wood to a central water drop-shaped mirror. Sold to a private collector in in Miami in 2013. 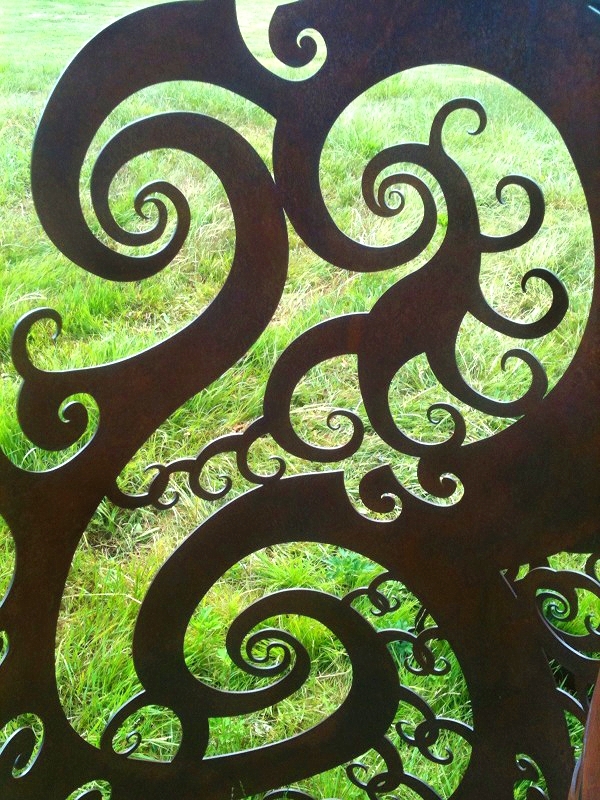 2011 - A Laser-cut steel sculpture made entirely of Fibonacci spirals at different scales. 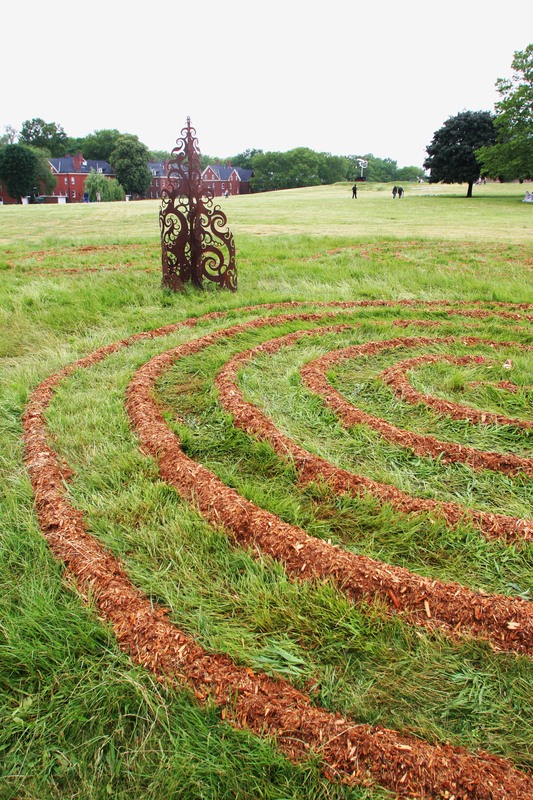 Created to be the central element of the 60' spiral Three Realms Labyrinth, on Governors Island NY at the Figment Festival and shown at Lightning in a Bottle festival in 2011. Part of my personal collection, not for sale. 2014 - This mixed media sculpture of tar, rubber, moss, acrylic and mirror was created especially for the brilliantly conceived Consenses multimedia art exhibition. Producer and Curator Sally Taylor asked artists to draw inspiration of their works based on an anonymous work given to them by another artist, which was in turn translated in to another creative medium by another artist. The chains of creative interpretation were begun from a secret source and passed on without knowing the other artists. Unbeknownst to us, each chain of artwork started with a photograph of a special place on the island of Martha's Vineyard. This first interpretation of that image started a secret exchange that created a chain of creative expression which included: photography, music composition, scents, dance, sculpture, painting, video works, even custom made teas. 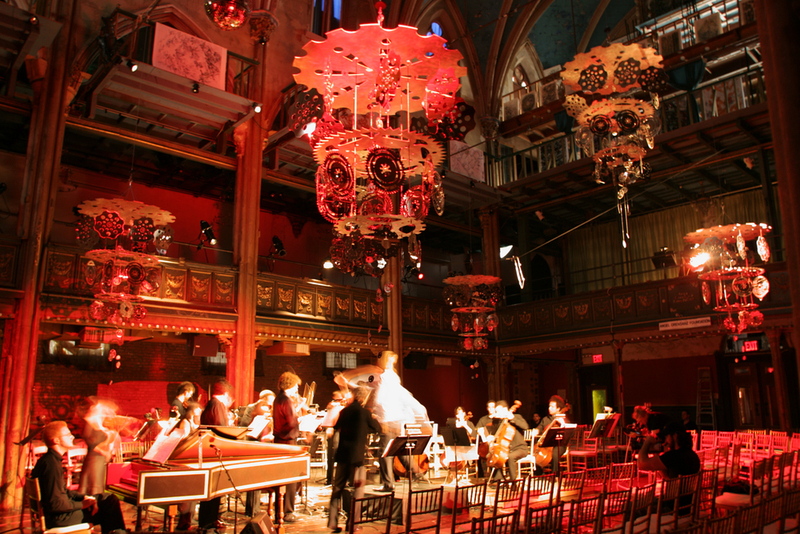 As a vast expression of the senses, Consenses explored the myriad creative ways to interpret an idea, that involved artists from around the world. Mining for Light was created after I was given an anonymous video of a woman's modern dance choreography - with no sound. Like each artist involved, I was told to create an interpretation within one to two weeks. The expression of my sculptural form is a micro illustration of a macro concept: within ourselves and every stratum of our Earth, there contains a dynamic life force that sustains us - if we, in turn, sustain it. At the end of the creative chain, when it was fulfilled by different artists in different mediums, it was revealed to us that the source image of this art work was a great old oak tree. 2014 - A personal project borne out of a need to express my view of the creation of system circuitry that will lead to AI (Artificial Intelligence). I wanted to make a minimalist pattern that also looked like petroglyphs, the earliest recorded art by paleolithic humans. 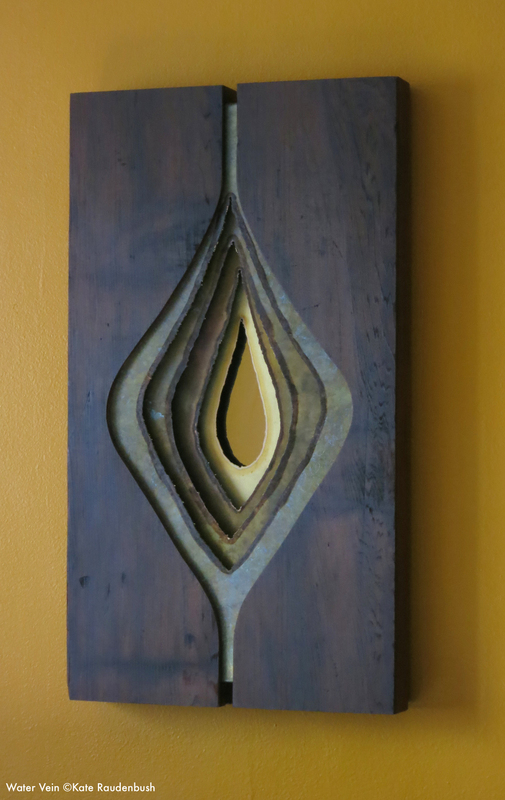 The metal elements of this wall hanging work are actually parts of the much larger Future's Past sculpture. 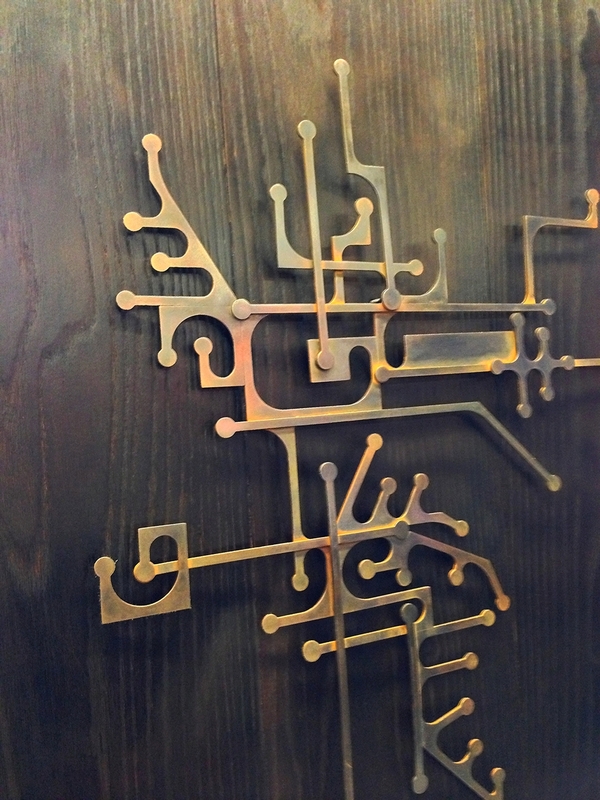 2010 - a custom sculpture made of plasma cut brass for a Burning Man benefit Gala, the Artumnal Gathering. One of the best parties of the year, held every november in San Fransisco, CA. Sold to a private collector in Palm Springs, CA. 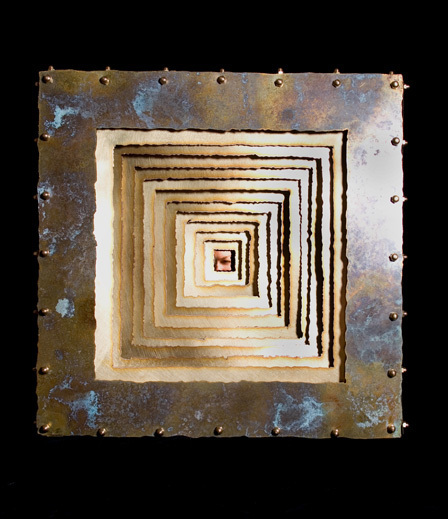 2011 - recalling a digital deity, Relic is a laser cut steel wall sculpture, made from elements of the much larger Future's Past sculpture.